With five of its villages and five cemeteries listed on the National Register of Historic Places, Westford has a rich and interesting history. Westford’s numerous ponds and proximity to the Merrimack and Nashua Rivers made this a likely area for Native Americans. There were seasonal fish runs in Stony Brook, the ponds provided freshwater fishing, and there were sites for agriculture and upland hunting and gathering. In his 1883 History of Westford, Rev. Edwin Hodgman notes several sites where Native American artifacts have been found. Native trails linking town centers at Chelmsford, Groton and Dunstable served Westford’s first settlers. Chelmsford, Westford’s parent town, was formed in 1655, and the area of Westford was first settled in the 1660s. By 1675 less than a dozen families lived in the area, it being too exposed and remote for development. The area was largely abandoned during King Philip’s War (1675-76) and experienced slow growth until the early 1700s. In 1724 Westford became the West Precinct of Chelmsford, and the first meetinghouse was begun on Tadmuc Hill. The First Parish Church was established in 1727. “Wesford” was incorporated as a town on September 23, 1729. An additional plot of land and part of Forge Pond were annexed from Groton in 1730, completing (after a small adjustment with Chelmsford in 1974) today’s town boundaries. The first tax list contained 89 names. A second village formed around mills at Forge Village after about 1730. The census of 1765 listed 962 inhabitants in 169 families and 143 houses. Westford men served in various Colonial wars, and over 280 Westford men served in the Revolutionary War. They fought from the Battle of Lexington and Concord to the defeat of Cornwallis at Yorktown. Lt. Col. John Robinson was one of the first officers at the North Bridge in Concord on April 19, 1775. First Parish built a late Georgian style meetinghouse at the town center in 1794. The Congregational Society split from First Parish in 1829 and built a late Federal/Greek Revival style meetinghouse on the common, now the Parish Center for the Arts. It was remodeled in 1896 with the addition of a Queen Anne tower and sash. The town Poor Farm was established in 1824, and a brick Federal style Poor House was built on the Town Farm in 1837. The Town Hall was built in 1870 and enlarged in 1880. The original Second Empire tower, toppled by the 1938 hurricane, was replaced with the present Colonial Revival tower. Five school districts were established in 1787 with schoolhouses in each district. New districts were added in 1806, 1822, and 1826. Westford Academy was incorporated in 1792, and a two-story late Georgian style Academy Hall was built in 1794 to the west of the common. Westford’s earliest economy was based on subsistence agriculture and the grazing of cattle. Some lumbering was done, and in 1669 the first sawmill was erected on Sawmill Meadow Brook, an outlet to Nabnasset Pond. Orchards were introduced in the 1700s. Naval stores – pitch, tar, and turpentine – were exported to Salem shipbuilders. Some tanneries were reported, as well as brick making in the southern part of town. There was continued activity at the forge and fulling mill at Forge Pond into the 1800s. In 1826-27 the first quarrying began at Graniteville, though granite had been taken before that date from surface boulders. In 1848 the Stony Brook Railroad was constructed from Lowell through Chelmsford, Westford, and Groton to Ayer. In 1872 the Framingham and Lowell railroad was completed with a stretch running along Route 27 in the southern part of town. A year later the Nashua, Acton & Boston Railroad (the Red Line) was completed running north-south through Westford. The Old Arch Bridge over Stony Brook is a remnant of this railroad. By the early 1900s, trolley lines extended from Chelmsford through Westford to Ayer, with routes between Whidden Corner and Graniteville, to Forge Village along Prescott Street, and to the town center along Main Street. In 1869 the Methodist Episcopal Church at Graniteville was organized, and the Gothic style church was completed in 1871 on land donated by C. G. Sargent. The first Roman Catholic church was built in 1892 across the street from today’s Saint Catherine’s church, built in 1934 in a late Gothic Revival style. The Forge Village Mission of St. Andrew’s Episcopal Church in Ayer began services in the 1903 building across from Cameron School, now a home. It served until 1961 when St. Mark’s Episcopal Church was built. First Parish and the Congregational church reunited in 1955 forming today’s First Parish Church United of Westford. Westford Bible church was built in 1974 and rebuilt in 2001 after the roof collapsed in a snowstorm. The school districts were expanded to ten in 1851 with the addition of Graniteville district. New schoolhouses were built in all ten districts in 1869-1874. Nine of these schoolhouses remain. Seven are privately owned. Parkerville schoolhouse, rebuilt in 1880 after a fire, is used as a working museum and meeting hall, and Cameron serves as the Senior Center. Later the town built Queen Anne style schoolhouses in Graniteville (Sargent School, 1884), Westford Center (Frost School, 1897), and Forge Village (Cameron School, 1872, remodeled in 1908 in Colonial Revival style). 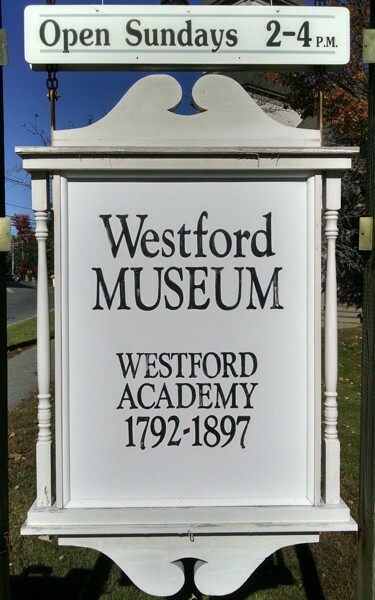 Westford Academy outgrew its original building, and in 1897 a second Academy building was constructed on Main Street. The highly ornamented building, designed in a late Victorian Richardsonian Romanesque style, is unique in Westford. It now serves as the Roudenbush Community Center. The Civil War had a great impact on Westford, as it did throughout New England and the nation. Westford sent over 200 soldiers to serve in the war, 36 of whom died in service to their country. The war effort required an increased production of cloth for uniforms, which helped the mills in Westford, and their owners, to prosper. Westford men and women fought in the two World Wars, Korean, Vietnam, and our more recent wars. They are remembered with memorials on the common and in Forge Village and Graniteville. From the 1870s to the 1920s most of Westford’s population increase came from the many foreign-born residents who came to work in the quarries and mills. By 1915 40% of the total population was foreign-born. French Canadians formed the largest immigrant group. Many immigrants also came from Ireland, England, Scotland, Sweden, and Russia, where Abbot Worsted actively recruited workers. In 1916 the original Westford Academy building, moved from its original location across Boston Road from the common to its present location in 1910, was converted for use as a fire station. After a new police-fire station was built adjacent to Town Hall in 1974, the old Center fire station was restored to its original appearance and became the Westford Museum. The improvement of the local roads, particularly Groton Road (Route 40), Concord Road (Route 225), and Littleton Road (Route 110), and the introduction of the automobile caused a decline in the use of the streetcar and railway lines, which were largely abandoned during the 1920s and 1930s. With the increased use of the automobile, more and more farmers sold their land to developers who built homes for the increasing number of residents who commuted to work in Boston or the western suburbs. This was particularly true after Interstate 495 was constructed through the town in 1961. Westford census figures saw double-digit percentage increase every year from 1910 to 2000, except for 1940, requiring, among other things, the construction of new schools. The third Westford Academy building, now Abbot School, was built in 1955, followed by the fourth in 1973, with a significant enlargement in 2000-01. Nashoba Valley Technical High School opened in 1969. Other new schools were the new Nabnasset School (1960), Norman E. Day School (1965), and Col. John Robinson School (1970), followed by the Lloyd G. Blanchard School (1992), John Crisafulli and Rita Edwards Miller Schools (2002), and the Stony Brook Middle School (2003). The mills in town began their long, slow decline after World War I. The worsted mill in Brookside was sold to the Abbot Worsted Company in 1920. Well into the 20th century agriculture remained an important part of Westford’s economy with dairy farming becoming the predominant agricultural pursuit. Local orchards produced apples and peaches that were sold as far away as England, although most of the produce went to Boston, often transported by local truckers. Strawberries were grown locally, and poultry was raised at several locations. With a population of 20,754 in 2000, Westford is today a residential suburb with some light industry and offices – and a great history.